Apr. 12, 2019 | Today marked our third annual BCS Comic Con! What began three years ago as a celebration of nerd culture has blossomed into a full day of exciting comic and pop-culture-themed activities. Spearheaded by former BCS librarian Courtney Morrison, the schedule included guest speakers, a costume contest, an art showcase, and gaming in the library. Our three guests, James Duncan, Valérie Deschênes, and Lorina Mapa, each spoke about an element of comic creation, including workshops on capturing emotion in drawn characters, drawing proportional human faces, and crafting comedy in comic strips. 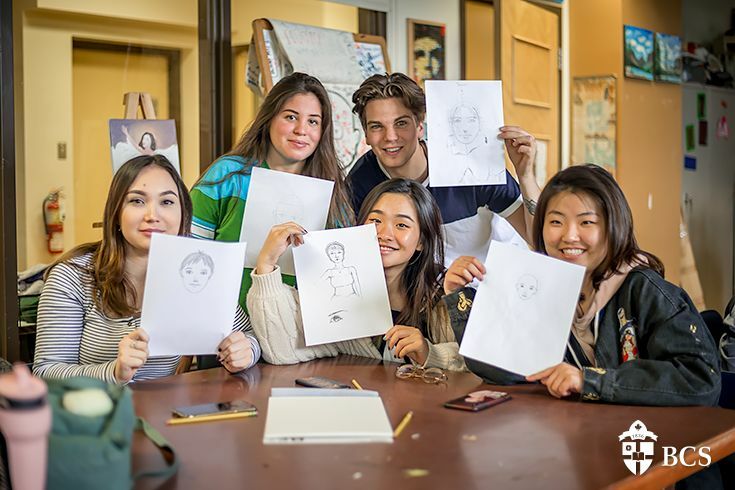 Following the workshops, the convention moved to the library where eight students and one staff member displayed their artwork. There were also gaming booths for students to try their hand at henna art or play a variety of games, and the Comic Con Committee gave out prizes to the best costumes. Congratulations to Izzy and Grace on their award-winning costumes, and thanks to all our artists (Grace, Pierre, Justine, Izzy, Amy, Luke, Angel, Laura, and Mr. Gordon) for sharing their incredible work with our community. Special shout out to Mr. Crowther and the Comic Con comittee for organizing such a fantastic event! View more of the day's activities on our Instagram story!